Resham, 10 years old, is one of the students referred to us from Sath Sath, a social agency that helps disadvantaged families in Kathmandu find accomodation, work, and basic provisions. Along with his older sister Nilkumari, Resham’s education had been funded by Sath Sath previously, but when they had to discontinue support in 2009 due to a lack of resources, NCEP took over his sponsorship. 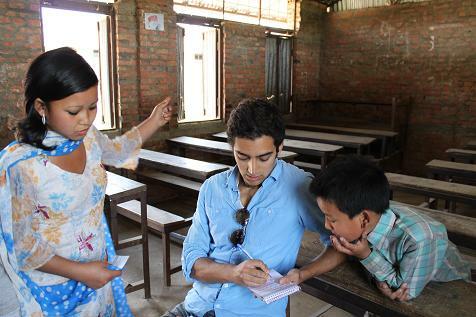 He is in his second year as an NCEP scholar, and has shown himself to be a promising student and young man. Resham’s father died recently, and in addition to his older sister, he has one small brother and one small cousin living with him and his mother, who works whenever she is able to. While his older sister is regarded by teachers to have more aptitude academically, Resham has a solid track record and good attitude, and is a very deserving candidate for the NCEP scholarship. Teachers have warned that he also has a mischievous side, and has occasionally been seen playing marbles in the street instead of attending class. Together with Sath Sath, we will offer support Resham to make sure he maintains his happy-go-lukcy, playful spirit, while still taking his studies seriously. 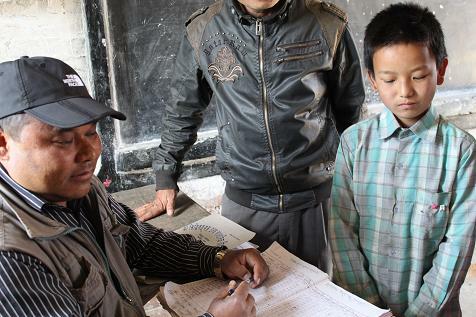 Resham’s class teacher shares his results from last term’s exams.